Towing a second vehicle with your motorhome offers a great means to further enjoy your lifestyle on the road. Planning destinations within a destination, having easier access to remote areas for outdoor activities, or making quick runs to a nearby grocery store are just a few of the conveniences of having a compact second vehicle at hand. For RVers who want to travel with a front-wheel drive car, a tow dolly may be the ideal travel companion. With a tow dolly, the drive wheels of your car are “off the pavement,” and as a result, no mileage adds up on your car odometer. Other advantages of many dollies available on the market now include easy installation, basic maintenance, and simple accessibility while on the road. Sound like a dolly is for you? Here are some key considerations when dolly shopping. For RVers who want to travel with a front-wheel drive car, a tow dolly may be the ideal travel companion. Tow dolly: To pivot, or not to pivot? Back in the day when most cars had steering wheels that locked up when the key was off, tow dolly manufacturers dallied with “articulating turntables.” The wheels of the towed car were on a platform that would swivel with the dolly wheels, allowing the steering wheel of the car to remain locked. The trouble with the idea, though, is if a tight turn was made, the pivoting of the turntable could at times cause the dolly fenders to “come in contact” with the car. One RVer recalls how his, “only 99 miles on the clock” car ended up in the body shop after his first trip out with a dolly. Not all dolly manufacturers use an articulating turntable. They’re not even really required for cars with locking steering. Simply load up the car, leave the key in the ignition and the wheel unlocked. If you do this, you’ll likely need to disconnect a battery terminal or remove the ignition fuse, or else you’ll put a nasty draw on the car battery. Many states require a braking system on a tow dolly – check with your DMV to be sure. 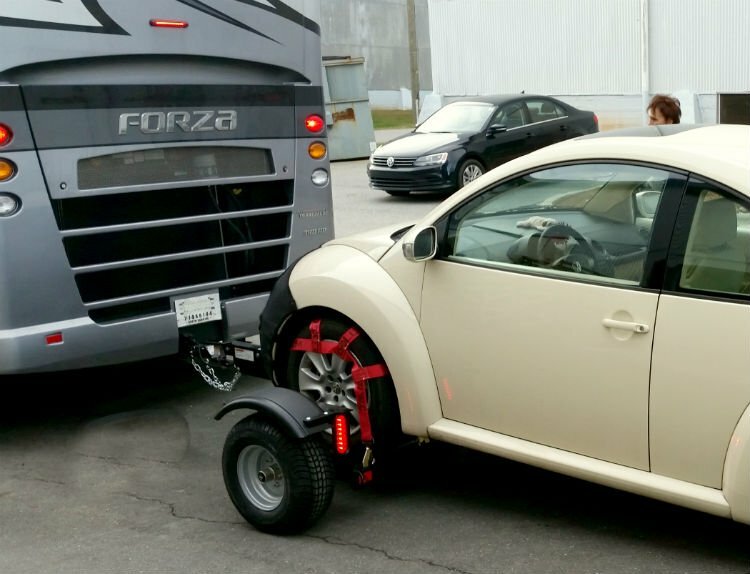 Many states require a braking system on a tow dolly—check with your DMV to be sure. 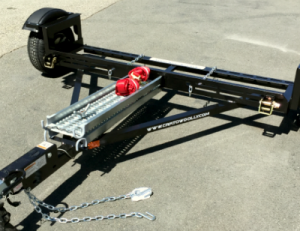 “Idler tow dollies” are units that come without brakes, and yes, they’re a bit less expensive. Electric brakes are like those commonly installed on travel trailers. You’ll need to have a brake controller in your tow vehicle. 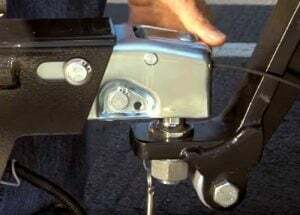 Once installed, and with the car on the dolly, you’ll need to take the time to carefully adjust the brake controller so that the dolly brakes work in smooth concert with those of your motorhome. In the event you need to tow the dolly without the car, light dolly brakes can sometimes lock-up when you step on the brakes unless you adjust the controller adjustment. To offset this, opt for Surge brakes, which use a piston on the dolly to actuate the dolly brakes. The system senses a shift in the dolly moving forward and puts on the brakes to the proper degree, hence no adjustment is necessary and there will be no problems with the dolly towed loaded or unloaded. Surge brakes, however, have to “push” on something, which means you’ll either have drum brakes or disc brakes. The former is more common, but they are known to heat up fast and cool down slowly, which can be a problem with long down-grades. They also require a little adjusting as they wear. Disc brakes forgo these problems. They are far less prone to overheating and don’t require any adjustment, other than topping off the dolly hydraulic fluid reservoir occasionally. When it’s time to replace the brake pads, they’re much easier to handle on a do-it-yourself basis. Find out how the frame of your tow dolly is built. Many dollies are “bolt together” design, while others are welded. As you cruise on down the road, into a campground, or another remote area, bolted-frame models can take a beating and require a regular inspection of nuts and bolts for security. A welded frame doesn’t require this—if you bang your dolly hard enough to break a weld or really loosen a series of nuts or bolts, you might want to think of investing in a condo instead of an RV. With all of the benefits of a welded-design frame, hydraulic surge disc brakes, and a comparatively light scale weight of less than 400 pounds, plus no articulation at the front of the dolly, chances are you’ll breathe easier when coming up on a tight turn or negotiating a steep grade on your next trip with a compact car in tow. Never back your motorhome without unhitching your dolly. Yes, we’ve heard of folks who swear they can do it, but for us ordinary mortals, it just isn’t a viable option. When the car is off the dolly, some motorhomes have enough clearance to put it partway under the rear of the coach. After unhitching the dolly, remember these are not light in weight, moving an unhitched dolly may require some assistance. If you insert your ignition key in the VW Beetle, turn it on and then off and leave the key in the ignition why would it drain the battery? I think this is the only way to leave the steering unlocked. Thanks for your question. If the vehicle allows you to leave the wheel unlocked in this scenario (key off), then it would seem you would have no battery drain issues. No need for pulling a fuse, nor disconnecting the battery. Just want to mention that’s not just the State where you live that may or may not require brakes on the dolly but it’s the State where you travel to. Good article. Couple of comments. A cop in Texas said I needed a “Vehicle in Tow” sign on the toad. I have said occasions where the wheel capture strap has worked itself off. Not sure why but of course happens after turns or bumpy roads. I had the same thing happen to me, but was informed by the trailer sales company prior to driving off & why it happens. You need longer straps due to your tires being larger than the straps can handle. I took a trip thru Texas & came back to the dealer to buyer the longer straps–they have never came off since. I wish I’d have listened right off the bat. Too scary to stop & find them off the tires! Good Article. I think one of the commentors really hit this important point: Make sure you know the braking laws when traveling to different states. It is probably easier to just use a braking system then to look up different state’s standards. Thanks for sharing! I usually tow a PT Cruiser, but also want to be able to tow a classic MG on my dolly. When I looked into flat towing, I was going to have to spend far more on the towbar, lighting, a braking mechanism, and a bracket each of the car(s) than on a reasonably priced dolly. I bought a used dolly, and did what refurbishing it needed, spending less than a new dolly. The dolly I bought is a small dolly because the MG is too narrow to fit on most standard dollies. The PT Cruiser just fits, the outside of the tires are on the outside of the ramps. I specifically looked for a dolly with 1) surge brakes, my class A has no wiring for electric brakes, and a turntable, because it’s only recently that have cars been made (again) with non locking steering. Most of what folks are going to tow is going to accommodate this, and I didn’t want to have to mess with pulling fuses or other fixes. On our last trip, I nearly got stuck in a gas station, and had to back up to the point of nearly jackknifing the rig, and the fenders didn’t contact the car. In addition, that’s why it has plastic fenders. Is it worth mentioning that if the dolly has a turn table the steering must either be locked or tied down? I towed around Texas without a problem, on the other hand, having 10 or so feet of car behind the dolly’s fender mounted lights made me a wee bit nervous, so using the class 2 receiver I made a mount that put a set of trailer lights at the back of the car about eye level. Cheap but effective. There is simply no good reason to run a dolly without brakes. In most states, the weight of the dolly plus towed vehicle is going to exceed the required minimum weight for towing. The difference in price means safety is cheap. Personally, I think that 4 down would be easier, but it won’t work for us at this time. I have a classic 1989 Ford Bronco with 4×4. I’m towing it behind my Rexhall and noted that it was one that pivots. Should I worry about damaging my Bronco? And, secondly, my dolly is a braking dolly, which I appreciate. Question, will my 4×4 tow without dropping a driveshaft? It does have a neutral position where all wheels are unlocked…would that be a problem or not? I prefer to think of this as a steering issue instead of using the term “pivot”. One of the two (dolly or the tow vehicle) has to provide steering. If the dolly has a fixed chassis, then the tow must provide the steering capability. If the dolly provides the steering, then the tow must have its steering locked. I use a Kar Kaddy SS which has a steerable chassis ( I believe it provides a 12% steering capability) and it requires the tow steering to be locked. Please note, any tow that has a push-button start capability (no key in the steering column), as is the case with my 2016 Toyota Highlander, likely uses an electronic-driven motor to lock the steering wheel and there is no way to manually unlock the steering column. In this case, you must have a dolly that provides steering. I just recently finished a 5k mile trip and my Kar Kaddy SS towed my Highlander just fine. The SS model has a tow arm that folds making stowage that much easier.